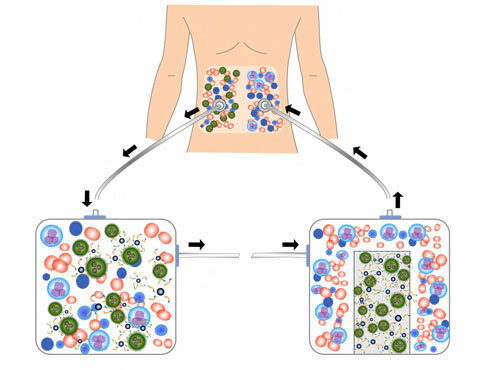 (Nanowerk News) A paper published in the January issue of the journal Nanomedicine could provide the foundation for a new ovarian cancer treatment option -- one that would use an outside-the-body filtration device to remove a large portion of the free-floating cancer cells that often create secondary tumors. Researchers at the Georgia Institute of Technology have formed a startup company and are working with a medical device firm to design a prototype treatment system that would use magnetic nanoparticles engineered to capture cancer cells. Added to fluids removed from a patient's abdomen, the magnetic nanoparticles would latch onto the free-floating cancer cells, allowing both the nanoparticles and cancer cells to be removed by magnetic filters before the fluids are returned to the patient's body. In mice with free-floating ovarian cancer cells, a single treatment with an early prototype of the nanoparticle-magnetic filtration system captured enough of the cancer cells that the treated mice lived nearly a third longer than untreated ones. The researchers expect multiple treatments to extend the longevity benefit, though additional research will be needed to document that -- and determine the best treatment options. "Almost no one dies from primary ovarian cancer," said John McDonald, a professor in Georgia Tech's School of Biology and chief research scientist of Atlanta's Ovarian Cancer Institute. "You can remove the primary cancer, but the problem is metastasis. A good deal of the metastasis in ovarian cancer comes from cancer cells sloughing off into the abdominal cavity and spreading the disease that way." Schematic of magnetic nanoparticle treatment. The removal system being developed by McDonald and postdoctoral fellow Ken Scarberry -- who is also CEO of startup company Sub-Micro -- should slow tumor progression in humans. It may reduce the number of free-floating cancer cells enough that other treatments, and the body's own immune system, could keep the disease under control. "If you can reduce metastasis, you can improve the lifespan of the person with the disease and get a better chance of treating it effectively," said McDonald. "One goal is to make cancer a chronic disease that can be effectively treated over an extended period of time. If we can't cure it, perhaps we can help people to live with it." Earlier in vitro studies published by the authors of the Nanomedicine paper showed that the magnetic nanoparticles could selectively remove human ovarian cancer cells from ascites fluid, which builds up in the peritoneal cavities of ovarian cancer patients. The nanoparticles are engineered with ligands that allow them to selectively attach to cancer cells. The researchers believe that treating fluid removed from the body avoids potential toxicity problems that could result from introducing the nanoparticles into the body, though further studies are needed to confirm that the treatment would have no adverse effects. The recently reported study in Nanomedicine used three sets of female mice to study the benefit of the nanoparticle-magnetic filtration system. Each mouse was injected with approximately 500,000 murine ovarian cancer cells, which multiply rapidly -- each cell doubling within approximately 15 hours. In the experimental group, the researchers -- who included research scientist Roman Mezencev -- removed fluid from the abdomens of the mice immediately after injection of the cancer cells. They then added the magnetic nanoparticles to the fluid, allowed them to mix, then magnetically removed the nanoparticles along with the attached cancer cells before returning the fluid. The steps were repeated six times for each mouse. One control group received no treatment at all, while a second control group underwent the same treatment as the experimental group -- but without the magnetic nanoparticles. Mice in the two control groups survived a median of 37 days, while the treated mice lived 12 days longer -- a 32 percent increase in longevity. Though much more research must be done before the technique can be tested in humans, McDonald and Scarberry envision a system very similar to what kidney dialysis patients now use, but with a buffer solution circulated through the peritoneal cavity to pick up the cancer cells. "What we are developing is akin to hemofiltration or peritoneal dialysis in which the patient could come into a clinic and be hooked up to the device a couple of times a week," said Scarberry. "The treatment is not heavily invasive, so it could be repeated often." The new treatment could be used in conjunction with existing chemotherapy and radiation. Reducing the number of free-floating cancer cells could allow a reduction in chemotherapy, which often has debilitating side effects, Scarberry said. The new treatment system could be used to capture spilled cancer cells immediately after surgery on a primary tumor. The researchers hope to have a prototype circulation and filtration device ready for testing within three years. 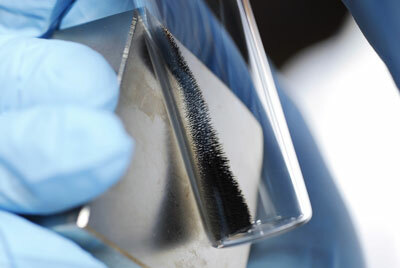 After that will come studies into the best treatment regimen, examining such issues as the number of magnetic nanoparticles to use, the number of treatments and treatment spacing. If those are successful, the company will work with the FDA to design human clinical trials. The researchers also studying how their magnetic nanoparticles could be engineered to capture ovarian cancer stem cells, which are not affected by existing chemotherapy. Removing those cells could help eliminate a potent source of new cancer cells. The research has been supported by the Georgia Research Alliance (GRA), the Ovarian Cancer Institute, the Robinson Family Foundation and the Deborah Nash Harris Endowment. A member of Georgia Tech's ATDC startup accelerator program and a GRA VentureLab company, Sub-Micro has also raised private funding to support its prototype development. Challenges ahead include ensuring that nanoparticles cannot bypass the filtration system to enter the body, and controlling the risk of infection caused by opening the peritoneal cavity. Beyond cancer, the researchers believe their approach could be useful for treating other diseases in which a reduction in circulating cancer cells or virus particles could be useful. Using magnetic nanoparticles engineered to capture HIV could help reduce viral content in the bloodstream, for instance. "A technology like this has many different possibilities," said Scarberry. "We are currently developing the technology to control the metastatic spread of ovarian cancer, but once we have a device that can efficiently and effectively isolate cancer cells from circulating fluids, including blood, we would have other opportunities."